As the recent hurricanes impacting the Caribbean and Southern U.S. have made clear, electricity is an essential building block for modern life. Being without power can throw whole societies into the dark, and in some cases put lives at risk. Of course, acts of nature cannot be controlled, but utilities do put in a huge amount of effort to try and ensure that they are able to keep the lights on - and when they can’t, that they are able to restore service quickly. Communications networks play an important role in utilities’ operations. Many power utilities are engaged in the process of modernizing the communications networks they have relied on for decades to support a variety of critical functions. Unlike many other types of enterprises, however, utilities’ networking requirements are truly ‘mission-critical’. As a result, when they look at advancements in the technology landscape, there’s an added element to their evaluation – can these technologies deliver the exceptional levels of reliability, resiliency and security that they require? Among the technology trends utilities are evaluating is the growth of the internet of things (IoT). 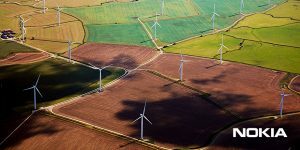 Utilities have the potential to benefit enormously from the wide array of sensors and other connected devices that can be employed throughout their grids to help make them smarter. Nokia is working closely with utilities around the world to help them determine how they can utilize IoT in their own operations. 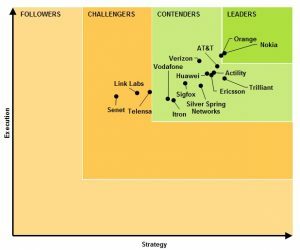 So, we were excited to learn that in a recent study conducted by Navigant Research, one of the top industry analyst firms covering the utilities market, Nokia was selected as the leader in the market for Low Power Wide Area (LPWA) networking for utilities. For those who don’t follow the IoT market closely, LPWA is a term used to define a set of rapidly evolving technologies that will be used to provide the connections between millions or even billions of sensors and the ‘smart’ part of the network, where data can be processed and decisions can be made to optimize the performance of the grid. Nokia surpassed 14 other venders and operators, who were rated on 11 criteria including: vision, go-to market strategy, technology, geographic reach, product performance, and product quality and reliability, among others. Naturally the emergence of IoT as a major industry driver is just one of the areas on which utilities are focusing in terms of network modernization. In light of well publicized instances of large-scale hacking of utilities for instance, significant attention is also being paid to topics like cyber-security and how best to protect the grid. Utilities are also looking at ways to utilize mobile networking technology, specifically LTE, to push intelligence further out into their distribution grid. Want to learn more about Nokia solutions for utilities? These topics and many more will be explored next week at European Utility Week 2017 event, which (October 3-5) in Amsterdambrings together a large community of utilities from Europe and beyond, along with the vendors that serve them, to explore key industry challenges and how best to chart a path forward. Nokia will be there to join the conversation and specifically address: the requirements for Field Area Networks (FANs) and the best options for ensuring FAN performance; the benefits of private LTE networks; the application of multi-protocol label switching (MPLS) techniques to support a range of critical utility applications; and finally, how you can effectively overcome cyber-security threats, which are growing in variety and volume. Visit our dedicated Utilities Solutions page to learn more. David is director of energy solutions marketing at Nokia, where he focuses on the role of modern communications for grid operations and as a foundation for an evolving utility business. More recently, David has also begun putting some of his ‘energy’ into helping oil, gas and mining companies modernize their communications networks.